Hemodialysis patients’ lives are ruled by their treatment schedules and symptoms. Missing just one appointment would be disastrous, resulting in the accumulation of toxins in the blood, hospitalization and possibly death. Hemodialysis reduces the body’s concentration of many important vitamins and minerals. Learning which nutrients are important, the best tests for them and how to approach supplementation when appropriate, patients are better equipped to discuss the best approaches with their doctors. A severe illness is a life-changing event. People on hemodialysis know this well. Their lives are ruled by their treatment schedules and symptoms. Three days a week for four hours each session, they must connect to a machine that filters toxins from their blood. In healthy people, this job is done effortlessly by the kidneys. But when the kidneys lose their ability to clean the blood, technology must take over. For many, missing just one appointment would be disastrous, resulting in the accumulation of toxins in the blood, hospitalization, and possibly death. And even when patients rigorously adhere to their treatment schedules, debilitating fatigue, depression, and muscle cramps can plague them. While the technology of hemodialysis is a miracle to those who need it, those who undergo this procedure experience complex emotional and physical reactions to their situation. Hemodialysis patients must scrupulously watch what they eat, since getting too much protein, potassium, phosphorus, and other nutrients can further damage whatever function the kidneys still have, and cause other physiological dysfunction. The spontaneity of traveling or seeing friends on a moment’s notice is gone forever, as they must faithfully show up for their dialysis treatments. The life they once enjoyed is over, and it is common for people to experience phases of anger, denial, and depression. Kidney failure is more than just a physical illness, it is also one that affects a person’s mental, emotional, and spiritual health. Like most things in life, if it isn’t broken, most people don’t give it much thought. Such is the case with the kidneys. They are a pair of organs lying on either side of the vertebral column underneath the last couple of ribs. (Interestingly, the kidney bean was named because its shape resembled that of our kidneys.) 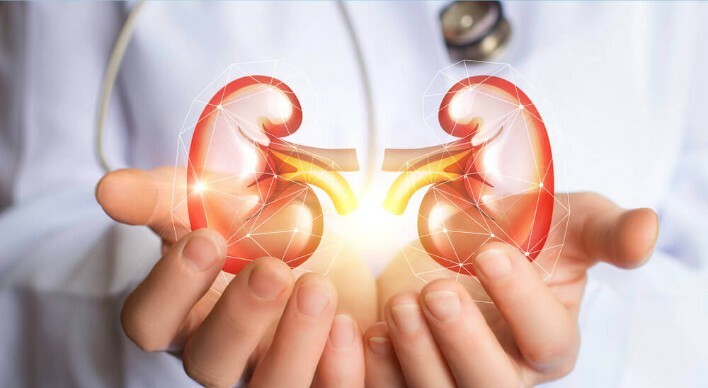 Each kidney measures about 4.5 inches long, 2.5 inches wide, 1.2 inches thick (11 cm long, 6 cm wide, 3 cm thick), and weighs approximately one-third of a pound (160 grams). About one million functioning units, called nephrons, make up each kidney. Nephrons are long, convoluted tubules that make urine by filtering small molecules and ions from the blood, then reclaiming the needed amounts of useful materials such as sugars, minerals, amino acids, and most of the water. As the nephrons reclaim these materials, the remaining mixture (called filtrate) becomes more concentrated, eventually forming urine towards the far end of the nephron. Urine then drains into a common funnel-shaped sac called the renal pelvis. The ureter connects the renal pelvis to the bladder from each kidney. Urine formed by the kidneys flows through the ureters into the bladder, where it is stored until it’s urinated out. The kidneys produce about 0.4 to 0.7 gallons (1.5 to 2.5 liters) of urine every day. The kidneys also help maintain the body’s balance of some minerals, such as sodium, potassium, calcium, and phosphate. They produce hormones that stimulate blood cell production in the bone marrow (erythropoietin) and help regulate blood pressure by decreasing the amount of blood filtered by the kidneys (renin). They also activate vitamin D, which is required for optimal calcium absorption by the small intestines, for maintaining bone density, and for proper immune function. These are just some of the actions of the kidneys, and if they are damaged, technology may need to take over the business of filtering and cleaning the blood. Dialysis is a surrogate for the kidneys’ crucial function of filtering waste from the blood. Without this technology, toxic wastes build up in the blood and tissues and cannot be filtered out by the ailing kidneys. This condition is known as uremia, which literally means “urine in the blood.” Eventually this waste accumulates and leads to death. There are two types of artificial dialysis—hemodialysis and peritoneal dialysis. In hemodialysis blood is removed from the body and passed through a filter in a dialysis machine before being returned to the body. Typically, the procedure takes about four hours and needs to be repeated every two to three days. Hemodialysis by machine requires a larger rate of blood flow and volume of blood than in other procedures, such as a routine blood draw at the doctor’s office. Therefore, special access to the arteries and veins must be created. In an outpatient setting such as a dialysis center, this involves the formation of an arterio-venous (AV) fistula (tunnel) or AV graft. To make an AV fistula, doctors surgically connect an artery to a vein under the skin. This direct link to the artery increases the blood pressure in the vein, which is elastic and expands to accommodate the enhanced blood supply. This procedure takes about four to six weeks to heal, after which needles can be placed so that arterial blood can be pulled off for dialysis, and the cleansed blood returns through the dilated vein. Two ports (entry points) from the dialysis machine are connected to the person, one in the artery for removing blood and one to the vein for putting blood back into the body. Inside the machine, the blood travels through a series of tubes coated with a solution to remove specific materials from the blood, and the blood also passes through a series of semipermeable membranes to further cleanse the blood. Peritoneal dialysis (PD) first started to be used in the 1980s. PD works by using the person’s own membrane that lines the abdomen, called the peritoneal membrane, as the filter to remove toxins from the body. A special solution containing dextrose (a sugar) is pumped into the abdomen. The solution pulls wastes and extra fluid into the abdominal cavity, where they remain until the solution is drained. The entire process of filling and draining, called an exchange, takes about 30 to 40 minutes, and the amount of time the solution remains in the abdomen is called the dwell time. PD must be done more frequently than hemodialysis, typically four times a day with a dwell time of four to six hours each. Peritoneal dialysis has been mostly replaced by machine dialysis. Hemodialysis reduces the body’s concentration of many important vitamins and minerals. Additionally, these patients are at greater risk for atherosclerosis (hardening of the arteries) than the general population because of an increase in free radicals and decreased antioxidants. Replacing the lost vitamins and minerals and supplementing with antioxidants is a rational approach to preventing complications from hemodialysis; yet, before taking mineral supplements, it’s essential that minerals status be determined. This can be done by testing the concentration of minerals in the serum, white blood cells (WBC), and red blood cells (RBC). Each of these—serum, WBC, RBC—are considered “compartments,” and minerals concentrate in different compartments depending on their biochemical functions. To get an accurate assessment of mineral status, minerals must be tested for in their appropriate compartments. Some dietary supplements have been shown to support healthy kidney function and may help people on dialysis. L-carnitine is an amino acid used by the body to turn fat into energy. It is produced by the liver and the kidneys and transported to other tissues through the blood. The highest concentration of L-carnitine is found in skeletal and cardiac (heart) muscles since these need large amounts of energy. L-Carnitine and the other amino acids that the body uses to create L-carnitine are removed during dialysis. People on dialysis are at risk for carnitine deficiency. L-carnitine supplementation by dialysis patients has been approved by the U.S. Food and Drug Administration (FDA) to prevent and treat carnitine deficiency, and its use is recommended in dialysis patients for persistent muscle cramps or hypotension (low blood pressure) during dialysis, lack of energy affecting quality of life, and skeletal muscle weakness. Clinical trials of L-carnitine supplementation in dialysis patients showed an increase in hemoglobin (the oxygen-carrying part of red blood cells), which allowed them to decrease the amount of erythropoietin (EPO, a drug that stimulates increased red blood cell production) they were taking. Like L-carnitine, Coenzyme Q10 (CoQ10), also called ubiquinone, is involved in energy production. It is also an antioxidant that can regenerate vitamin E. Most body tissues contain CoQ10, but the highest levels are found in the heart, liver, kidneys, and pancreas. This important molecule also functions as an antioxidant, which protects cells from damage. CoQ10 can be decreased by some drugs, including beta-blockers, statin-type cholesterol-lowering drugs (e.g., Lipitor), some diabetes drugs, and possibly some tricyclic antidepressants (e.g., amitriptyline [Elavil®], imipramine [Tofranil®], nortriptyline [Pamelor®]). Statin drugs block the biochemical pathway that produces cholesterol; however, this pathway is also responsible for generating CoQ10, which is why statin drugs reduce CoQ10 levels. CoQ10 levels have also been found to be decreased in people on dialysis. Two randomized, double-blind, placebo-controlled trials have been conducted on CoQ10 for people with chronic renal failure. In the first of these studies, 21 volunteers who were either on dialysis (15 of them) or not on dialysis but with a serum creatinine ≥ 5 mg/dl (six volunteers) were randomized to receive 180 mg of water-soluble CoQ10 or placebo per day for 28 days. All other treatments, including furosemide, intravenous fluids, iron, calcium vitamin D and erythropoietin were administered to both groups. There were no differences in the number of patients in each group on dialysis at the beginning of the study; however, after four weeks, significantly fewer volunteers taking CoQ10 remained on dialysis compared to the control group (36 vs. 90%, respectively). During this same period mean concentrations of blood urea nitrogen and serum creatinine significantly decreased, while creatinine clearance and urine output significantly increased in the CoQ10 group compared to control. Volunteers taking CoQ10 also had a significant increase in vitamins A, E, C, and beta-carotene and a significant decrease in blood markers of free radical damage. The second, larger and longer randomized, double-blind, placebo-controlled trial, evaluated the use of 180 mg/day CoQ10 or placebo in 97 patients with chronic renal failure for 12 weeks. Of those, 46 were on dialysis and 51 were not on dialysis. This second study verified the findings of the first. After 12 weeks of supplementation with CoQ10 significantly fewer volunteers were on dialysis compared to the placebo group (12 vs. 24, respectively). CoQ10 significantly decreased blood urea nitrogen and serum creatinine and significantly increased creatinine clearance and urine output compared to control. Volunteers taking CoQ10 also had a significant increase in vitamins E, C, and beta-carotene and a significant decrease in blood markers of free radical damage. No adverse events associated with CoQ10 supplementation were reported in either study. Rubidium is a trace element, meaning that relatively small amounts of it are needed by the body. It is distributed in tissues throughout the body and is involved in regulation of chemicals in the brain that controls mood and other functions. Rubidium is reduced by dialysis, and depression in some dialysis patients has been linked to decreased rubidium. The connection between rubidium and mood was discovered in 1891 when the cardiologist Botkin “observed that cardiac patients treated with RbCl [rubidium chloride] experienced increased well-being.” Supplementation with rubidium may be appropriate for dialysis patients, but it can deplete potassium and must be balanced with a minimum rubidium-to-potassium ratio of one-to-one. Rubidium is only available through compounding pharmacists and should be taken only under the guidance of a qualified healthcare professional. Calcium is the most abundant mineral in the body. Almost all of the calcium—99%—is stored in bones and teeth, where it provides the hard structure of these tissues. When blood calcium levels drop, the body releases hormones that stimulate the release of calcium from bones into the blood, where the remaining 1% is found. Calcium is important for adequate bone density, nerve impulses, muscle contraction, blood pressure regulation, and blood coagulation. Calcium from the diet or supplements is absorbed in the small intestines. While a limited amount of calcium can be absorbed by itself, the presence of active vitamin D increases calcium absorption four-fold. In order to play this important role in increasing calcium absorption, vitamin D must first be activated by the kidneys, then transported to the intestines. In chronic renal failure, vitamin D activation by the kidneys is impaired, resulting in decreased calcium absorption. When calcium is low the parathyroid glands, which are actually embedded in the thyroid gland, secrete parathyroid hormone (PTH). This hormone has three major actions. It stimulates the activation of vitamin D3 to increase intestinal absorption of calcium, increases calcium release from bone into the bloodstream and calcium reabsorption by the kidneys, and increases phosphorus excretion by the kidneys. In chronic renal failure, the decreased activation of vitamin D3 stimulates excessive PTH production, a situation called hyperparathyroidism. Elevated PTH can lead to osteoporosis. Vitamin D is routinely given to dialysis patients to reduce PTH. Calcium is also a “phosphate binder,” which means calcium attaches to phosphate in the blood and removes it through the urine. Calcium is routinely given to dialysis patients to bind and remove excess phosphorus, a condition known as hyperphosphatemia (high phosphate in the blood), which can be fatal. Regulating how much phosphorus is consumed through the diet is also an important strategy for ensuring hyperphosphatemia does not occur. Phosphorous, like calcium and PTH, is routinely monitored in dialysis patients. Magnesium is an important mineral for the body. More than 300 enzymes require magnesium for proper functioning. It is essential for the production of cellular energy, normal heart function, and blood pressure regulation. Approximately 60% of the magnesium in our bodies is located in the bones, 25% is in muscle, and the rest in fluids and soft tissues (e.g., muscles). Magnesium is also involved in energy production in green plants. One molecule of magnesium is in every molecule of chlorophyll, the green pigment involved in transforming solar energy into chemical energy the plants can use. That is why the largest dietary source of magnesium comes from dark, green leafy vegetables, such as kale and chard. Other dietary sources of magnesium include coffee, tea, cocoa, whole grains (refined grains have lost 85% of their magnesium), tofu, nuts, beans, and seafood. People on dialysis need to be cautious about not consuming too much magnesium since it’s difficult for their kidneys to filter enough magnesium from their blood. When magnesium accumulates in the blood, a condition called “hypermagnesemia” develops, which literally means high magnesium in the blood. Magnesium levels are routinely checked in dialysis patients, and any dietary modifications patients might alter their blood magnesium levels. Low magnesium can also cause problems, such as high blood pressure and fatigue. Vitamin C, also called ascorbic acid, is a water-soluble vitamin with many important functions. It is required for the synthesis of collagen (connective tissue) that contributes to the strength and elasticity of blood vessels, tendons, ligaments, and bone. Hormones such as epinephrine (adrenaline) and neurotransmitters (signaling molecules that communicate between nerves) require vitamin C. As an antioxidant vitamin C protects the body from free radicals that are generated during normal metabolism and during times of stress. Humans cannot make vitamin C and must obtain it in food and/or as a dietary supplement. Vitamin C has many potential benefits for people undergoing hemodialysis. It increases vasodilation and blood flow in these patients, which is crucial for the delivery of nutrients and decreases DNA damage. For people taking EPO, supplementation with vitamin C increases the body’s responsiveness to the drug. Vitamin C also decreases lipid peroxidation (free radical damage to fats) in hemodialysis patients, a benefit researchers speculate is due to vitamin C’s synergistic action with vitamin E.
Vitamin E is a fat-soluble antioxidant that is a mixture of eight natural compounds—four tocopherols (alpha, beta, delta, and gamma) and four tocotrienols (also alpha, beta, delta, and gamma). These forms occur together and in various concentrations in different foods. Vitamin E protects lipids in the body from being damaged by free radicals. Once vitamin E is used up stopping this injury, it is said to be “oxidized.” Vitamin E can quench free radicals again if it is regenerated by the action of vitamin C or CoQ10. Antioxidants work together, so ensuring an adequate supply of them is important. Most clinical trials have used just the alpha-tocopherol fraction of the vitamin; yet, supplementing with alpha-tocopherol can decrease gamma-tocopherol by 30–50% by speeding up the rate at with gamma-tocopherol is metabolized. Similarly, gamma-tocopherol can decrease alpha-tocopherol levels. Supplementing with just alpha- or gamma-tocopherols can potentially create an imbalance in the body’s antioxidant system. Inflammation and cell damage by free radicals is an important contributor to the development of cardiovascular disease. Supplementing with alpha-tocopherol significantly decreased biomarkers of oxidative stress in 36 dialysis patients (12 women, 24 men; ages 21-75 years [mean 49 years]) who had been undergoing dialysis three days per week for more than three years. While in the second study of 15 hemodialysis patients, supplementing with gamma-tocopherol but not alpha-tocopherol significantly lowered median C-reactive protein (CRP, an indicator of inflammation) by more than 50%. Supplementation with vitamin E has improved clinical outcomes in dialysis patients and is now being recommended by some researchers; however, some dialysis patients have elevated alpha-tocopherol compared to gamma-tocopherol levels, while in others the opposite is the case. Thus, supplementing with natural vitamin E with mixed tocopherols, instead of an isolated component of vitamin E (e.g., just alpha-tocopherol) might be beneficial. The B vitamins, which include thiamine (B1), riboflavin (B2), niacin (B3), pantothenic acid (B5), pyridoxine (B6), cobalamin (B12) and folic acid, are water-soluble vitamins involved in many biochemical reactions. B12, B6, and folic acid are all essential for the production of the neurotransmitters norepinephrine, dopamine, and serotonin. These neurotransmitters contribute to a sense of well-being. During times of stress (physical and/or emotional) the body uses more B vitamins. Folic acid is also important for the formation of red blood cells. These two metals have many important functions in the body. They are necessary for proper connective tissue formation and for optimal immune system functioning. Superoxide dismutase (SOD) is an antioxidant with its highest concentration in the mitochondria, which are structures in cells that produce energy. SOD is also highly concentrated in white blood cells (WBC), which are the cells of the immune system. Without SOD mitochondria can be damaged and the amount of energy produced in the body can decrease. The ability of the immune system to fight infections can also be compromised. Ensuring an adequate supply of manganese and zinc is one way of protecting the body against cellular damage. It’s important to note that both of these minerals can be toxic in high doses, and prolonged zinc supplementation can lead to copper deficiency. Supplementing these and other minerals should only be started after appropriate laboratory testing and under the supervision of a healthcare professional skilled and knowledgeable in natural and nutritional medicine. Cod liver oil is a rich source of essential fatty acids (EFAs), vitamin D, and vitamin A. EFAs are fats that the body cannot manufacture and must be supplied through diet. There are two major classes of EFAs—omega-3 and omega-6. The omega-3 fatty acids include eicosapentaenoic acid (EPA) and docosahexaenoic acid (DHA). Cod liver oil is a rich source of EPA and DHA, which have anti-inflammatory actions in the body. It’s important if people are going to supplement with cod liver oil that they consume a pure source of the oil. Fish stocks globally are becoming more contaminated with industrial wastes such as heavy metals and other chemicals. It’s advisable to consume only cod liver oil that has been tested for these contaminants. Your health care team may be able to provide recommendations. Iron is used by the body for the delivery of oxygen to tissues and for proper functioning of certain antioxidants. Iron can be depleted in dialysis and should be tested for and replenished when appropriate. If you take iron, one of the highest potency, most absorbable product on the market is NBI’s Ferrosolve.